...that John-117 considers Samuel-034 to have been the strongest SPARTAN? ...that the first three Halo games happened only in three months, with Halo Combat Evolved in September, Halo 2 in October to the middle of November, and Halo 3 from November to December 2552, with its epilogue in early 2553? ...that the war sphinx was a type of powerful fighting suit worn by Forerunner Warrior-Servants? ...that all copies of Crackdown gave access to the Halo 3 Beta? Edge was a Halo Online multiplayer map. The map is a symmetrical map that is set in a Forerunner databank which is entirely set into a cliff face. It is reasonably small, consisting of two bases, each with four tunnels leading out of them. These tunnels emerge on either side of the map, in two large rooms, which are essentially reflections of each other. 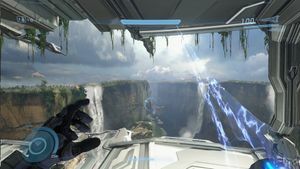 On one side, an Energy Sword can be found, and the room is open with a view of several waterfalls descending into a chasm, above which the map is situated. The opposite room contains a Gravity Hammer and two Beam Rifles, and instead of a landscape, its view is of the databank, maintained by flocks of Constructors. The Constructors on this map are capable of being destroyed. The loading screen of this map. A view of the map. For a complete list, check out our Levels directory.